Prime Minister Tun Dr Mahathir Mohamad walks with Pakistan President Dr Arif Alivi (L) during a courtesy call at the President’s House on March 23, 2019. New Delhi (VNA) – Malaysia and Pakistan on March 23 signed memorandums of understanding (MOU) on five cooperation projects aimed to strengthen trade cooperation between the two countries. The deals cover the fields of automaking, telecommunication, meat, banking and defence, according to Pakistani Minister of Asad Umar. The Pakistani government has adjusted its policies to attract more foreign investment and strengthen trade, especially with neighbouring countries, Pakistani Prime Minister Imran Khan said. On the occasion, Malaysia and Pakistan decided to establish a ministry-level committee which will regularly meet to seek ways to boost bilateral trade. Khan described the decision as a golden chance for the two countries to strengthen economic cooperation. 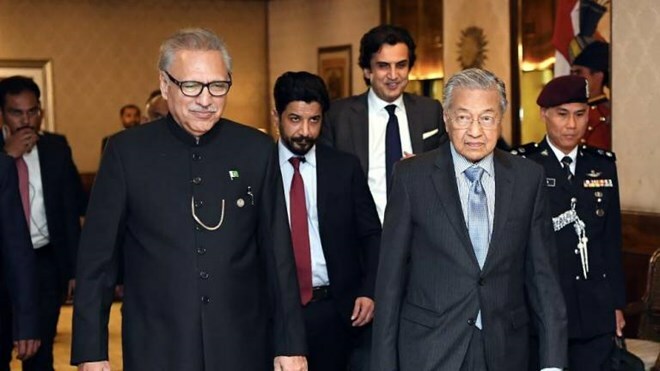 Meanwhile, his Malaysian counterpart Mahathir Mohamad said his country attaches importance to trade with Pakistan and asked the latter to improve the business environment to attract more foreign investment, hoping to intensify the bilateral trade as it is beneficial to both countries.